Take a break from the city and head to Penang National Park (Taman Negara Pulau Pinang) and Batu Ferringhi Beach. 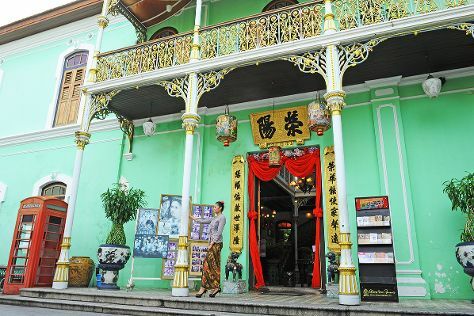 Do some cultural sightseeing at Chew Jetty and Pinang Peranakan Mansion. There's lots more to do: admire the landmark architecture of Kek Lok Si Temple, explore the world behind art at Teochew Puppet and Opera House, take a stroll through Gurney Drive, and look for all kinds of wild species at The Habitat Penang Hill. To find where to stay, reviews, traveler tips, and more tourist information, use the George Town holiday maker tool . Singapore, Singapore to George Town is an approximately 2.5-hour flight. You can also do a combination of bus and flight; or drive. The time zone difference when traveling from Singapore to George Town is minus 1 hour. In January, plan for daily highs up to 36°C, and evening lows to 28°C. Wrap up your sightseeing on the 20th (Sun) to allow time to travel back home.